Cut pork into pieces (3 inches length, 1/2 inch thickness). Marinate pork with cooking wine, 3 tbsp soy sauce, 1/2 tsp five spice powder and dashes (extra) ground white pepper. Marinate for 30 minutes. Heat 2 tbsp oil in a wok and sauté shallots, ginger, garlic and green onions until aromatic. Add marinated pork and stir until the surface is cooked. Add remaining ingredients. Cook on high heat, uncovered, until it boils for 5 minutes. Turn down heat to medium low, continue cooking, uncovered, until the meat is tender (to maintain the bouncy “QQ” texture of the skin, I arrange the skin facing up half way through cooking). Add more water if necessary. Serve with steam rice. Add ground pork to the stew to make ground pork stew 鹵肉, which is also delicious on steam rice or noodles. 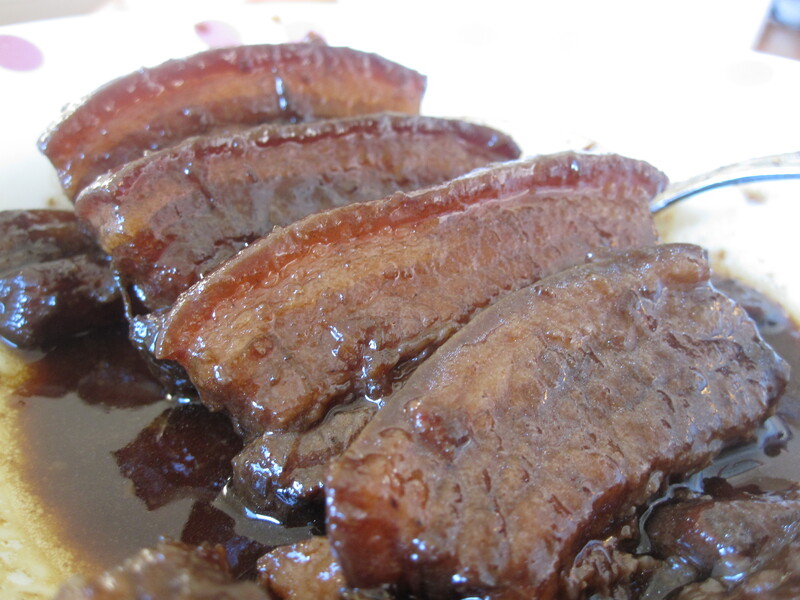 Stewed pork belly can also be the filling for steamed pork belly buns 焢肉包. I found out the flavor of stewed pork belly is very similar to my all time favorite canned meat sauce 香菇肉醬, which is not available in US. Next time, I want fine tune the recipe and make the meat sauce.